9/9/2012-It was a gorgeous Sunday afternoon at Hickory Motor Speedway as it was Zloop afternoon at the races and the fans were treated to quite a race. 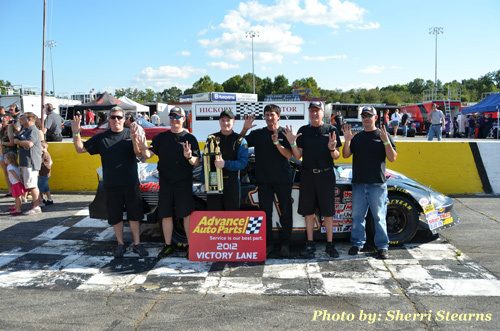 The event started with exciting news as Hickory Motor Speedway announced the ZLOOP Big "10" Challenge for 2013 with 10 special NWAAS Bojangles 100 lap Late Model Events that will pay a bigger purse and 2,000 to win along with a special ZLOOP point fund for the 2013 Challenge Winner. The #03 of Kevin Eby lead the field to the green in the WrenchRags Street Stock race, followed closely by the #33 of Mark Whitten and the #64 of Marshall Sutton. Eby would lead flag to flag and take the checkered flag with Whitten, Sutton, the #16 of Roy Smith and the #5 of Dillon Crouch rounding out the top five. In the Hobby Stock race the #83 of David Hasson took the win followed by the #57 of Jason Byrd and the #-1 of Ronald McNeill. Jason Byrd is the 2012 Hobby Stock Track Champion. The #21 of Monty Cox would start from the top spot in the Paramount KIA Limited Late Models and the action would get hot early. Cox took the early lead followed by the #15 of Brandon Atkinson, the #07 of Josh Bralley, the #97 of Brandon Lynn and the #51 of Jeremy Pelfrey. Several cars were battling for position throughout the field. Lynn peeked to the bottom of Bralley on lap 14, but could not make it work. Cox pulled out to a small lead but was followed closely by Atkinson. Lynn moved to 4 th around Bralley on lap 23. Caution fell on lap 24 when the #28 of Jason Crouse spun in 2 and collected the #7 of Travis Byrd. Caution flew again on lap 32 for a spin involving Crouse and setting up a 3-lap dash for the win. Caution flew again on the front stretch with a multi-car pile up, still leaving 3 to go. At the stripe it would be Cox, Atkinson, Bralley, the #00 of Shane Lee and Lynn rounding out the top 5. Brandon Atkinson was awarded the win after Cox failed post race inspection. The #1 of Pietro Fittipaldi would be your fast timer in the 100 lap NASCAR Whelen All-American Series Bojangles Late Models on Zloop day. The #12 of Austin McDaniel took the early lead, but Fittipaldi followed closely behind with the #43 of Jesse LeFevers, the #11 of Matt Piercy and the #2 of Trey Gibson in tow. The race was slowed by 1 caution, with an exciting restart and battles throughout the field. At the stripe it was McDaniel, followed by Fittipaldi, Wimbish, LeFevers and the #4 of Mackena Bell. In the 4 Cylinder race the #21 of Todd Harrington started on the pole, followed by the #3 of Donnie Harmon and the #51 of Nathaniel Kanupp. Caution flew on lap 17 for the spin of the #00 of Patrick Shiflett. Harrington would lead them to the checkered flag followed by Harmon and Kanupp. The Super Truck race started with the #02 of Jason Cochran on the pole. He led flag to flag taking the victory, with the #33 of Jeremy Birch moving to second, the #03 of Chase Campbell finished third after battling door-to-door with the #27 of Trey Pitts who finished 4th. Next Saturday Night - September 15 th join us for Championship Night Presented by Cargo Transporters & Gaston Rentals featuring the Bojangles Late Models – 100 laps, Paramount KIA Limited Late Models – 35 laps, WrenchRags Street Stocks – 30 laps, 4 Cylinders – 25 laps, Super Trucks – 35 laps and Red Baron Renegades – 20 laps. Gates will open at 5pm and Racing begins at 7pm. Adults - $10, Teens/Seniors - $8 and children 12 & under free.